There is something delightful about a Saturday with no obligations or commitments. I decided it was time for a solo game. It seemed like a month or more since the last one but its actually only been 3 1/2 weeks and 3 weeks with no game at all prior to Thusday's game! Not usual for me these days. I had an urge to get my 54mm Britain's out but fresh from reading Bob Kettle's 1/72nd Cold War battle report, and the Archduke's 1/72 Western Desert Portable Wargame Sittingbad, it was on my mind that I had yet to try the Advanced Mid-20thC PW. 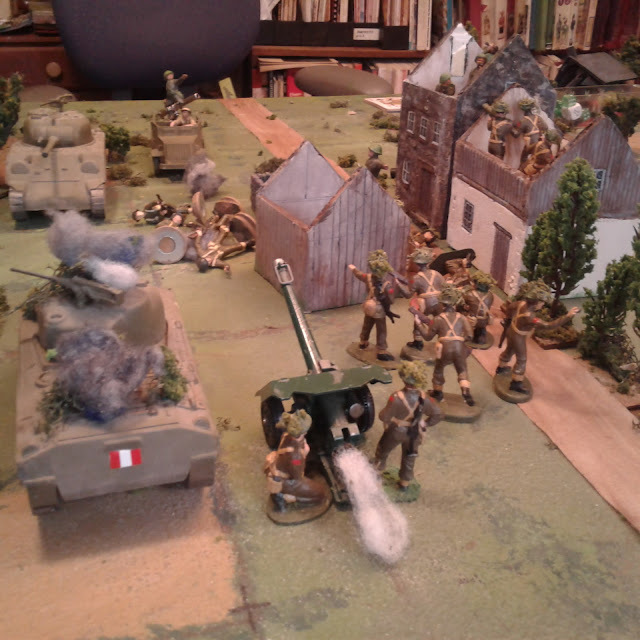 I decided to grab One Hour Wargaming and my 1/72 Cold War forces and have a quick game. An hour later I had my table cleared of the various bits of junk that seem to creep on it if left alone. An hour after that I had a scenario and forces selected and the game laid out. Finally I drew a card, looked at the table and thought "Nope! Not enough tiny little guys to get me interested." Hmmm. "More troops?" Not what I had in mind. "AHA!" Its been over 4 years since they've been out but I still have a box of Khaki 54's and a few tanks and guns in the back of the cupboard! Big enough to see and mid-20thC. Done! The Red Patch Rebels clash with the Royal Green Helmets. I had had an urge to do Sawmill Village but wanted something less familiar so I flipped open OHW Wargaming to a random page and got: #16 Advance Guard. OK inspired by a PanzerBlitz scenario but essentially Not Quite Sawmill Village. Call it fate. 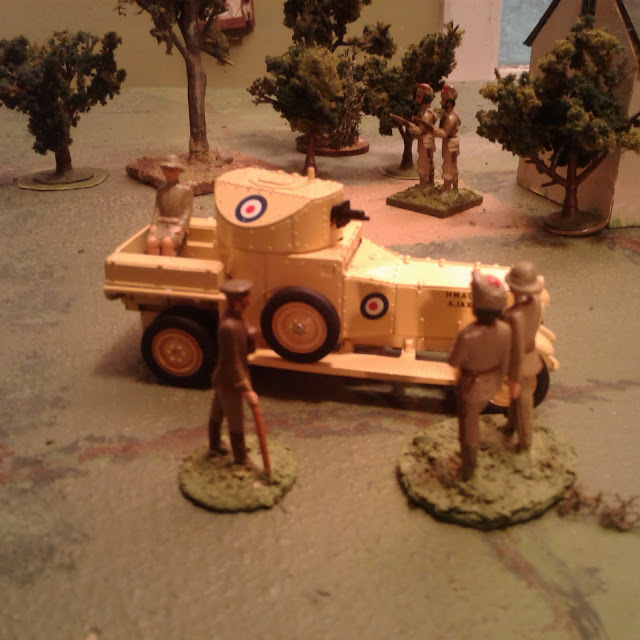 I didn't have a background for this conflict so I sorted out my Airfix and Atlantic WWII Canadians from the various Herald and Crescent figures, rolled up forces then divided the equipment. By the end of the game I had identified the Not-Canadians with their Red 1st Div Patches as some sort of Socialist Republican rebels leaving the 1950's guys to be the loyal defenders of the Duke of Somewhere's Commonwealth. The Green Helmets had a CO, 3 infantry companies supported by a mortar, a Sherman and an SP Recoilless Rifle. The Red Patches had a CO, 4 infantry companies, a B.A.T and a Sherman. To claim victory one side would have to have sole possession of the town at the end of 15 turns. Both sides had an Exhaustion Point of 9. The fighting rages near the 1/2 way point. 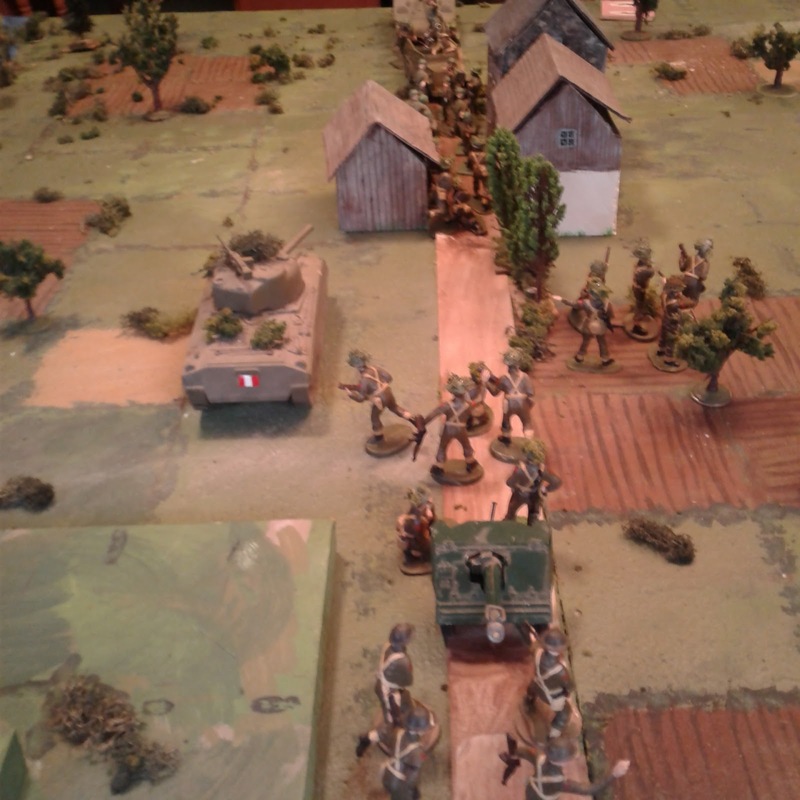 Before too long, both sides had rushed infantry into the town and they were locked in combat. In no time everyone was pinned. They couldn't move away or assault so all they could do is stick their heads up blaze away needing 6's to hit then duck back down. Then the Red Patch commander had the bright idea of outflanking a unit of pinned Green Helmets in the town and pushing them out of the town with an assault. It didn't work too well, they missed and were soon pinned down in the open by RR rifle and tank fire and wiped out in a few turns. The Socialist tank followed in short order. Added to the losses in town the Socialist troops were exhausted by turn 10 but clung to their positions in town while the BAT did its best to remove the threat from enemy armour whenever they came in range. Things look grim for the Socialists. For most of the game the Ducal mortar had been pounding the town to little effect until the Socialists sent over a flag of truce to point out that they were in contravention of the rules of war which stated that Mortars could fire over adjacent infantry which were spotting for them but didn't say that they could fire over one town block to hit another. 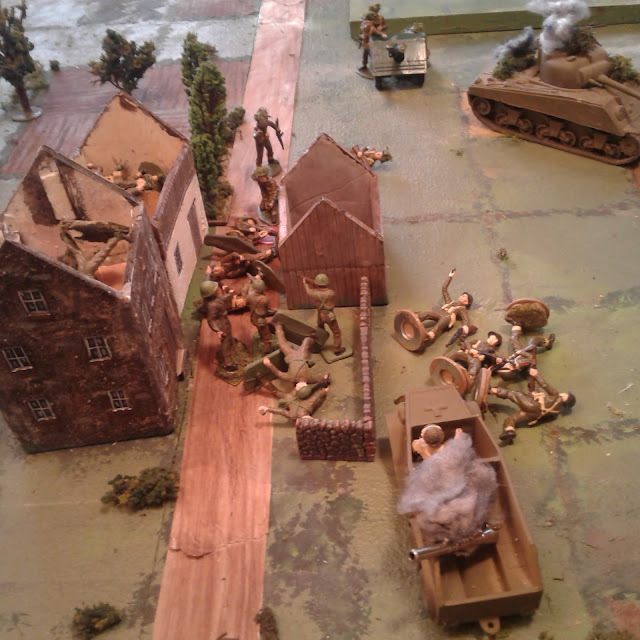 The mortars had to pack up and shift to the flank but it didn't help their aim much after all. Finally, as the clock started to wind down, every Ducal unit that wasn't pinned or destroyed was sent forward to try to get a line of fire on the last houseful of Red Patches. The BAT soon took care of that though and the Ducal losses also brought them to Exhaustion. Only one Red Patch remained in town and only one turn to remove him by fire alone from the mortar and one battered company of infantry. So close to a draw! With the last die roll of the game a 6 cut down the last Red Patch in town, leaving the town in the hands of the remnants of one pinned Green Helmet company. So ended a close and absorbing game. There are still a few rules I need to get straight in my head or need to make a house ruling on. For example, a pinned unit cannot move, but can it change facing? For that matter, I seem to recall doing infantry drills for all around defence when on exercise and don't quite see why an infantry unit can't adopt such an all around posture if it doesn't move, at very least if it is defending a town block. I was surprised to finally notice mid-game that the rule for infantry fire at tanks says they cannot "destroy" them, not that they can't inflict any hits at all. Given the 1950's setting allowing them some AT defence at 2 squares seems reasonable. The other main thing I need to double check, then make my mind up on, is the effect of a retreat result on a pinned unit. I understand that a pinned unit cannot move voluntarily although it seems odd that tanks can't withdraw under fire even though they are not exactly "hitting the dirt!" Part way through the game I decided to double check the rule saying that pinned units can't be pushed by a retreat result but suddenly couldn't find it. I'll need to look again more carefully (Update: found it! Its up front not in the 20thC rules themselves) but am leaning towards adopting a house rule saying that a Pinned unit may not move voluntarily but will obey a retreat result if otherwise able to. This will avoid the several situations I encountered where adjacent opposing units were both pinned meaning neither could retreat or rally until one of them was destroyed. It doesn't sit right with me that retreat, even under cover, would never be an option once you take a hit when close to the enemy so allowing an involuntary retreat seems like a good compromise. In addition, this rule makes Elite troops no better than Militia once they are pinned while adjacent. If I keep to the no retreat rule I'll have to borrow the basic game option of asjusting SP's up 1 for Elite's and down 1 for Militia. In any event, I think I need to tidy these lads and their friends up and see about some new equipment and a proper back story. To paraphrase MacArthur: "They shall return!". At last! A game! A good game! Ron had been planning another attempt to convert DBA3 to hexes but I countered with the Portable Ancient Wargame. The scenario was Hill Line Defence from Programmed Scenarios. I drew Gauls and Defend. Sigh.... I'd much rather have rolled "Defend with the Romans" or "Attack with the Gauls" but Omens are Omens. 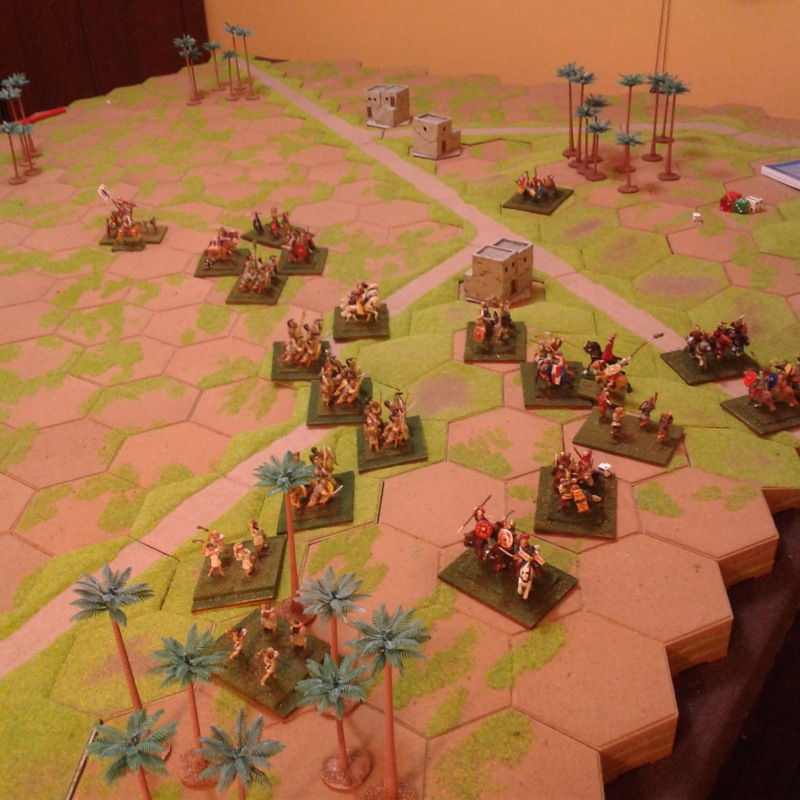 I spread my 9 units out, hoping to have the speed to concentrate once I could identify the Roman's main thrust. Ron concentrated his 11 units in the centre, but initially threatening both my flanks with light troops. As he slowly closed he finally shifted his line of cohorts to his right and rapidly struck the hill on my left. I was outnumbered in units and missile power but even more so in exhaustion points and was unable to make much use of my barbarian charge bonus while defending. My best hope seemed to be to try to slip past his flank to try to distract him while attacking some of his weaker units and to launch a preemptive charge to use my barbarian charge bonus to inflict losses and to gain retreat room for myself. 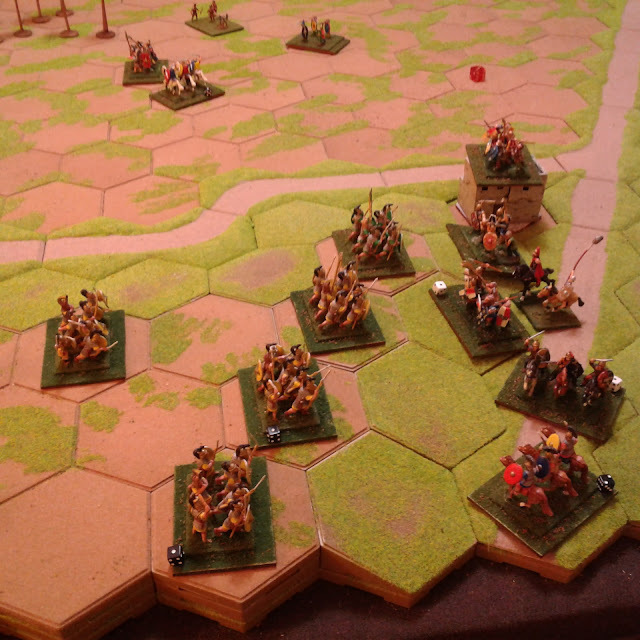 Alas, between being a little slow to commit and some unfortunate initiative flips my plan did not quite work and the main battle saw the Gauls in a fairly passive defensive mode on the edge of the hill while my flanking manouver had minor impact. Mid-game. The Romans have pushed onto the hill and my diversionary flank attack has stalled but all is not yet lost. A unit of Roman cavalry managed to push through my line but despite driving it back against the table edge, I just could not get the final hit which would destroy it so it persisted in being a major obstacle to a controlled withdrawal. Relentlessly the main line of Roman infantry pressed forward, pushing me off the left hand hill as I reached my exhaustion point of 12. Technically, according to the scenario victory conditions, the game was a draw at this point but Ron had only lost 7 out of 15 exhaustion points and without a time limit I had no doubt that he could surround and destroy me before I could exhaust him and even if I did, his ballista and slingers could eventually finish the job so I conceded. The exhausted Gauls have been pushed off the largest hill and concede. 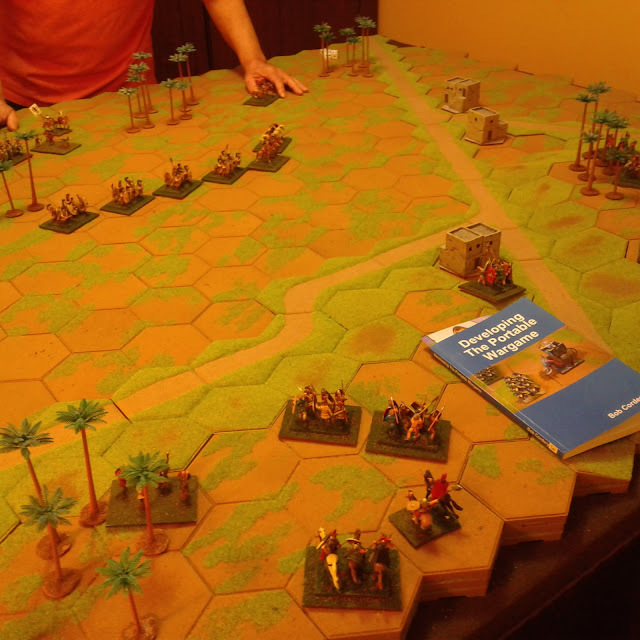 This was our first test of the published version of the Ancient Portable Wargame and provided just the sort game we were looking for with simple rules with no "gotcha" tactics. The dice had their effect at times but I can't blame my defeat on them! We did come up with a few minor house rules. The main one was to enhance the rules for breaking contact. They say that a unit can not move adjacent to the front of another enemy unit but may move adjacent to the flank/rear of an enemy. We added that it may not attack that unit that turn if they do and banned a unit from moving away then circling around to finish the move in contact with the flank of the unit it had disengaged from. We also decided to modify the shooting arc to a straight 120 degree arc on the hexfield. This was just to make it easier to trace the arc of fire, especially for the ballista. Lastly we rules that if a General was attacked on his own, he could not fight back in close combat and did not stop units from moving on but was not automatically killed either. When you live in a 160 year old wood frame house, its pretty much inevitable that there will be periodic repairs and maintenance and some of those have been keeping me too busy for hobby stuff this week. I'm almost done the current job but in the meantime here's a musical interlude, a song about the legendary Brian Boru by the near legendry Alan Stivell. 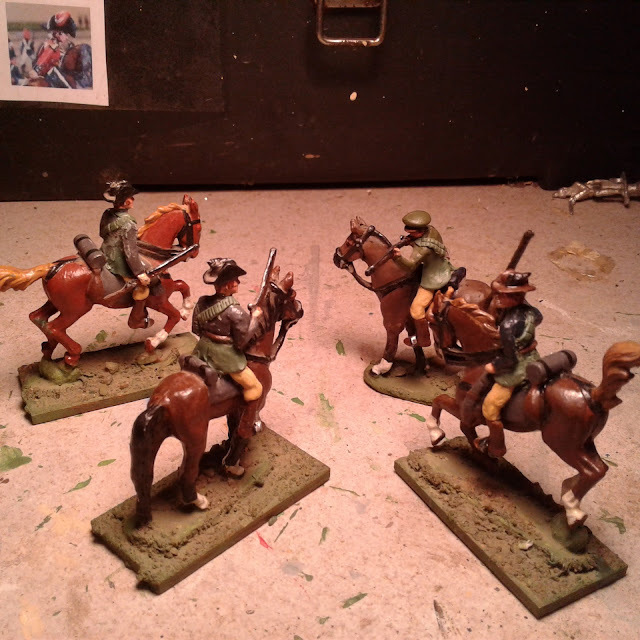 The first four Oerberg Riders have had their clothing and equipment updated. Dismounted Riders will follow then the other halves of these two squadrons. I was going to put in before & after pictures but umh, well, apparently, despite having appeared in many battle report photos, only one or two have had their portraits done. Oh well, what's done is done. Anyway, when I originally decided to go for the Shiny Toy Soldier look 10 years ago, this is more the look I wanted. At the time though, I had somehow managed to convince myself that my table was too small for anything but musket era battles in 40mm, hence the choice of the 1840's. The Constabulary has now acquired a PomPom gun crew who have retired from Oberhilse service and light blue trousers and donned tan ones to fight for Oerberg. Just before interrupting myself for last Saturday's game set in.........what is the current accepted term for Twightlight years of the Roman Empire? Anyway, I was about to start updating some more old figures. 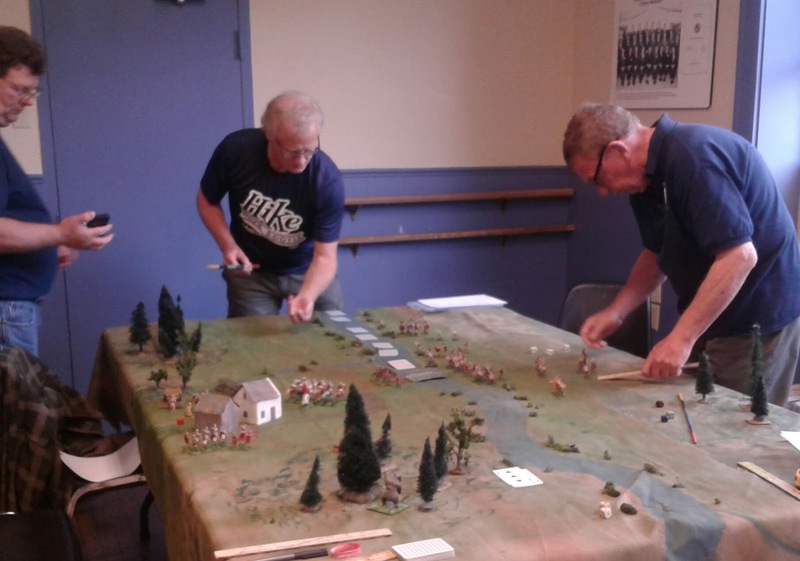 Oerberg Militia preparing for battle. 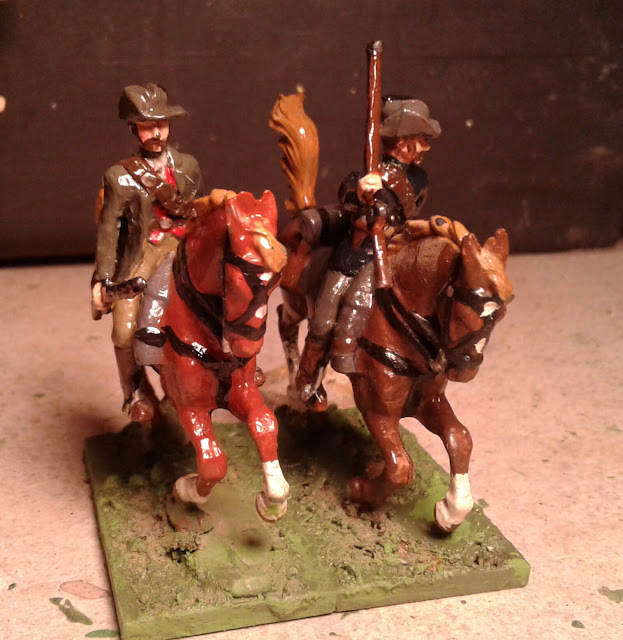 These lads were recruited almost a decade ago (in my pre-blog 'MacDuff on the Web' days) as a unit of Irregular mounted rifle unit, for my aborted Oregon War. The figures are Scruby ACW cavalry, in shell jackets, most wearing slouch hats. 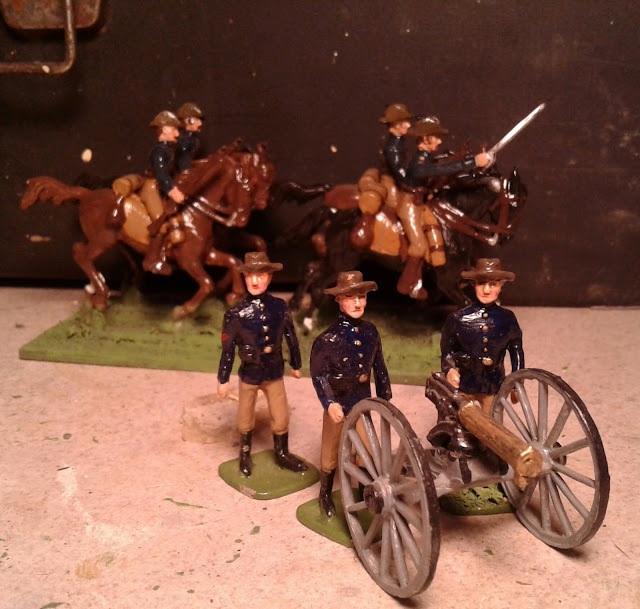 I took advantage of the original alt-history setting to borrow inspiration from various attractive uniforms from the 1840's ranging from Cape Mounted Rifles to Texas Rangers. 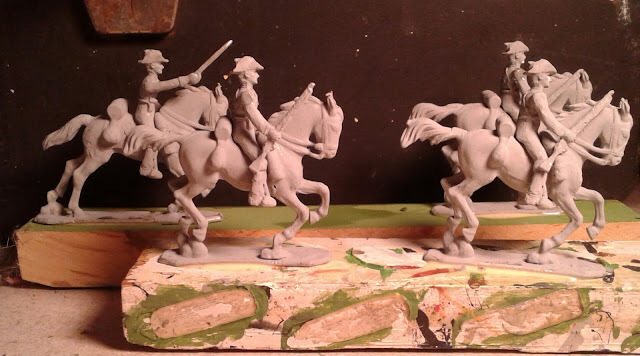 Since I have decided to jettison the 1840's I now need these favourite figures to blend into an early 20thC setting so I have set to with my renewed store of Greenstuff to lengthen jackets and add ammunition bandoleers. A lick of paint and varnish plus some regulation 2 man bases and there will be 2 stands of Oerberg citizen soldiers from two different units. I need to replace a couple of broken horses before I update the next 4 figures. It was the King's County Tabletop Game Fall Game Day in Kingston NS today so I took the opportunity to run 40mm Elastolin Late Roman vs Barbarian game using Mildly Modified Medieval Mayhem rules. The game was played for the fun of a game with friends, but also to give me some practice for my upcoming Huzzah game which will be a larger multi-faction affair. This game was a 3 sided border skirmish in Northern Britain. Roman, Saxon and Pict all had different victory conditions. The Romans had to evict all non-Romans from the Roman side of the river while minimizing losses. The Saxons had to establish a bridgehead , minimize losses and get rid of as many Romans as possible regardless of who did it. The Picts were out to bring home some beef on the hoof while minimizing losses. Bonus points were earned by having your Commander engage in an heroic duel with an enemy Commander. The short version is that we enjoyed the game. It took about 3 hours to play, had some ups and downs in fortune and the winner remained in doubt right up to the end. All in all then, it worked. However, the rules were designed for a narrow set of parameters with the intent of being able to read everything off the table as in looking at the table and being able to see what was what. That worked well with the 100 Years context with only a handful of figure types so that it was easy to tell knight from man-at-arms from archer and no units, just retinues. In this game, with smaller, more fanciful, figures and about a dozen variations of troop type and 4 levels of morale, it was much harder for players to recognize who was what. It also felt odd to me for Roman infantry to drift from unit to unit and so on. 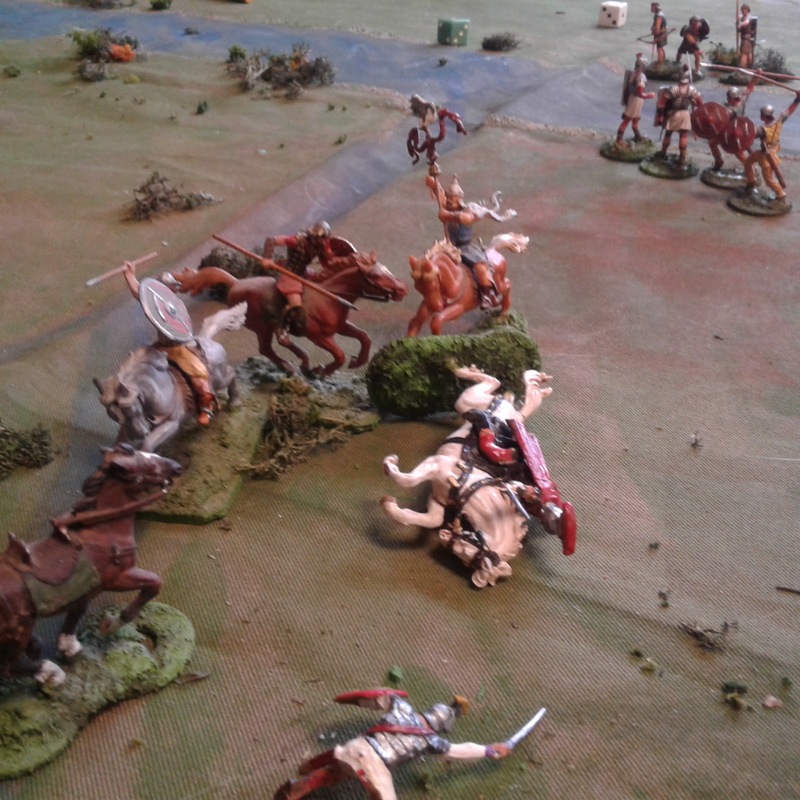 The skirmishers and horse archers sort of worked without any special rules but at the same time they didn't really feel 'right'. I'm also concerned because even with only 3 players I found myself taking rules shortcuts and being very liberal as to what I allowed in order to keep the game flowing. I have no idea how Rob manages to keep so many single combats flowing with 6 or 8 players. I suspect this may be where having fewer troop types helps? Anyway, my conclusions are that the Mayhem system could work OK for my game, but I would like something which flows faster, less time spent on combat resolution and identifiable units which stay together with separate characters. Something like what I used for a 54mm Prince Valiant game at Cold Wars about 14 or so years ago. Bit of trivia for the day. It seems the bugler who sounded the Charge for the Light Brigade at Balaklava was named William Brittain. Not the same spelling as the famous maker of Toy Soldiers but close enough to elicit a "Hunh! How about that.". 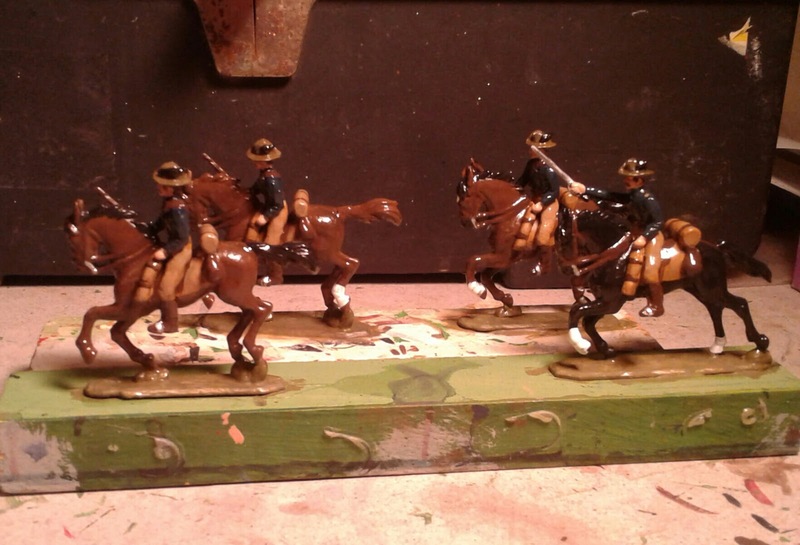 Oerberg Republican Constabulary galloping towards their assigned bases. Just got to cut one more base and mount these lads up. I did some digging back through old posts and it seems they've been in the "to be done" pile since at least March of 2015. Practically new then! I had a mental image of how they should look but couldn't quite remember what sparked it. The Blue and khaki smacked of Teddy Roosvelt and his Rough Riders so I looked them up and close but not quite right. Eventually I remembered a B&W lithograph in my old faithful, pages falling out old, Boer War book. Sure enough there they were, illustrations of the British South Africa Mounted Police, in action during the Matabele War and Jameson's Raid. I must have imagined the colours at the time based on the B&W shading where the shirts were darker. As far as I can tell it is roughly right though in younger years I might have made an attempt to roll the sleeves up and open the neck. Anyway eight had been bought to provide Mounted Police and ordinary Commandos for Oerberg so they've ended up in the right place. Dismounted O.R.C's to follow along with non-uniformed Oerbergers ere too long. It didn't take long for me to realize that I had not been clear in my last post that I was celebrating having solved a longstanding puzzle to do with the background and history of the fictional world that I initially started work on nearly 20 years ago. However, I was too busy casting figures, modifying maps and imagineering (as Bill Protz says) to post again yesterday. Thank you all for the well meant, and appreciated, suggestions. Atlantican Guides. Grey sheepskin cap with red bag, black coat. Zinnbrigade conversion. Meanwhile, I've been busy casting and converting some new units. Sometime this month I will post an updated map and background page on the, so far, largely unknown northern half of Atlantica. That will lead in turn to the real start of planning and preparing for the series of wars that started in 1895. Uncovering the history of places that never were. The original development c 2000 of what became known as Atlantica was documented on my old webpage: With MacDuff on the Web. One day I should recover the files from disk while (if) I still can. 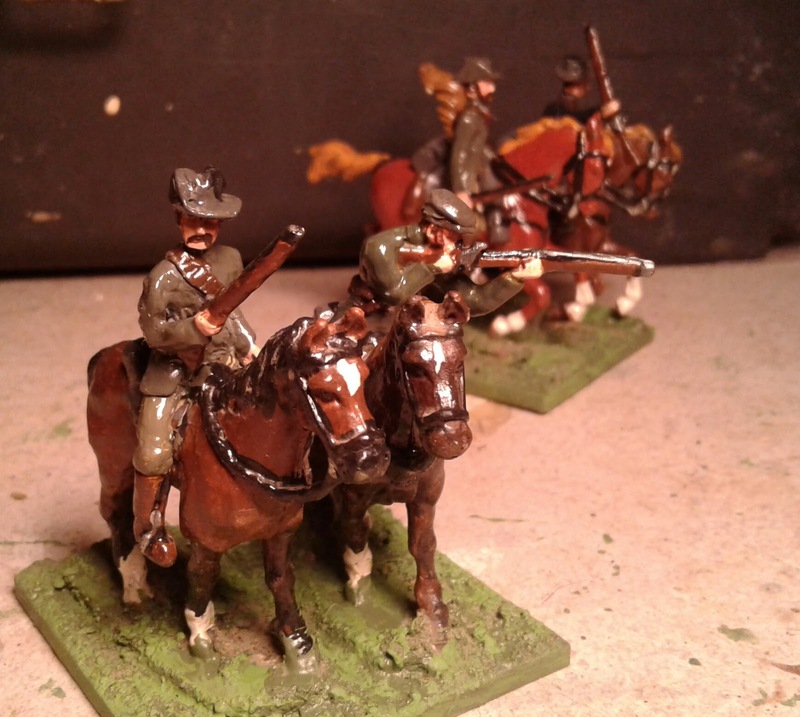 Oerberg Republican Constabulary.Scruby ACW on Zinnbrigade horses. Blue shirts, drab hats and pants. But in the mean time, there are troops to paint! So where is he going with this then? For a number of years now I've been trying and failing to get a "Colonial" campaign going within the context of the shiny Toy Soldier Island of Atlantica. I've started on a couple of what seemed like good ideas which have all stalled. There seem to have two major sorts of obstacle. The first comes when I just can't seem to get motivated to work on the sort of figures that fill out what seems like a good option. The second comes when there is some sort of clash between what I get from my reading about the original history and what I want from my games. For example, the Boer War appeals but the range of credible scenarios is very limited and one has to either accept the limitations or leave the inspiration far behind. Neither option is attractive in cases where both matter. There is one sort of troops that I originally wanted to fit into Atlantica but later erased as a different backstory developed, almost against my will. That was Cossacks! I also wanted to sort of Afghan-ish mountain tribes and some hint of an Indian Mutiny sort of 'thing' where trained native troops rebelled. All of this was of course to be set around the middle of the 19th Century and WWI was not on the radar. As the time frame moved forward I came up with a vague blend of ideas blending Boer War, and Mexican revolution themes. These ideas could work but then a chance discovery did me in and sent me right back to long ago to old dreams of Cossacks, trains and machine guns. At the time I was looking at Canadian involvement in WW1 and also reading what I could find about the various non-European campaigns when I came across Colonel Dunster's diary from the Baku expedition. The what? Where is Baku and why were British trops there, let alone a handful of Canadians? Well, its in the Caucasus and they were there to train soldiers, including Armenians, to fight the Turks. I might have let it go but at the time there was talk of a Canadian expedition to the region to train Armenian soldiers 100 years later. Now, I have no intention or interest in setting up an historical campaign in this twisted, multi-faction setting that involved not only the British vs the Turks during WW1 and the Russian Civil War but also a host of bitter racial and religious factions with all the bloodshed and cruelty that tends to unleash. However, its alien enough to me that I'm happy to invent my own fake-history and I've always had a 'thing' for Cossacks and for hardy mountain tribesmen, and WWI and for armoured cars, trains, and .... well. Have a look at this Australian War Memorial movie. The B&W clip should start at a significant point with a certain piece of equipment which is painted a very light grey which is fairly close to the tropical uniforms and the surrounding terrain. The whole clip is well worth watching though. Surprisingly there are other videos on the Caucasus in WW1, not surprising most are not in English though often dubbed or subtitled. "Yes, I know that I approved the order, Willoughby, but still, I mean, it IS rather a bright yellow don't you think?" "Never mind, it is very modern after all and as you say, in the Fall, the ripe grain fields can be quite yellow. Should do very nicely. Well done........Now, explain to me again why you had them paint little targets on the side?." Once More Unto the Bridge! After a bit of experimenting with possible alternates, I jotted down some brief rules notes and reset the table. Turn 2. One company of British skirmishers has been driven back by NY Riflemen and a chance card has halted the 104th but otherwise, things are going smoothly. This time the fort was defended by a 2 company battalion of Miitia aided by an independent company of Riflemen. The reinforcement consisted of a 4 company battalion of Regulars and another company of riflemen all under the recovered General Wavey. 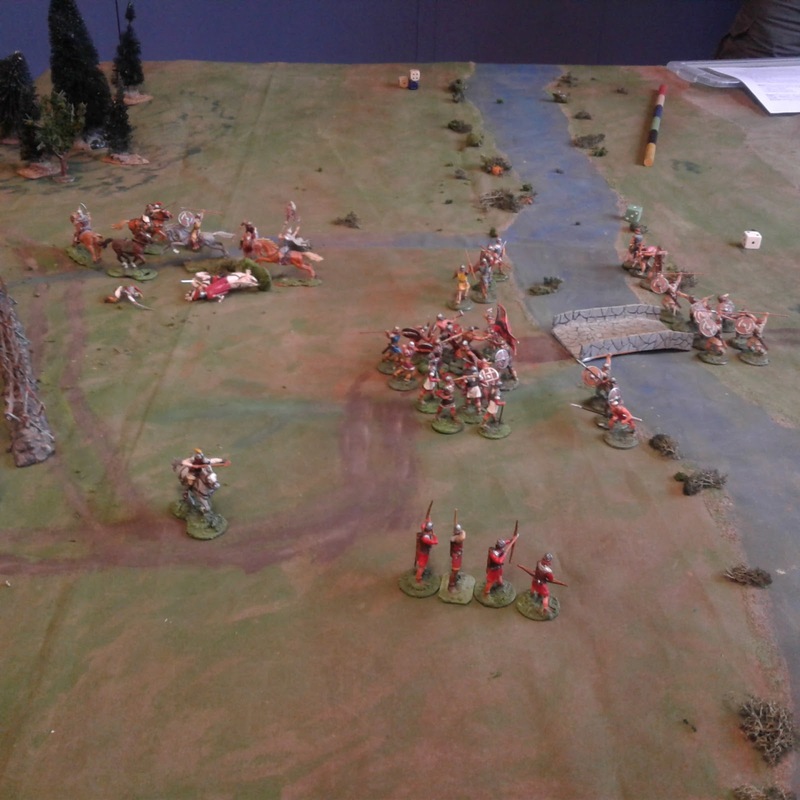 The British were now deployed as 2 separate companies of skirmishers, 1 each of indians and sedentary militia skirmishers, a 6 pounder and the 5 company strong 104th Foot. Each company was represented by 4 figures and could take 4 hits. For formed battalions, 1 company is removed for each 4 hits. Each company fights with 1 die except artillery which get 2. A unit taking hits equal to the number of stands left after applying hits checks morale. Isolated units need to roll to move. Near the end of the game. All is yet to play for but the British appear to have the upper hand. The turns clicked over so quickly I forgot to take pictures. The Indians quickly crossed over the river and then refused to move for most of the rest of the game until finally they rushed forward, took 1 hit and fled back into the woods. Between control checks, 1 shot and a morale test they managed 10 x 1's and 2's out of 11 die rolls! The British skirmishers eventually managed to gang up on the riflemen and see them off while the gun and militia slowly picked off the garrison until they could take no more and on turn 14 they decamped. That left the clash of the regulars, 4 companies vs 5. At this point, I'd like to launch an official complaint. 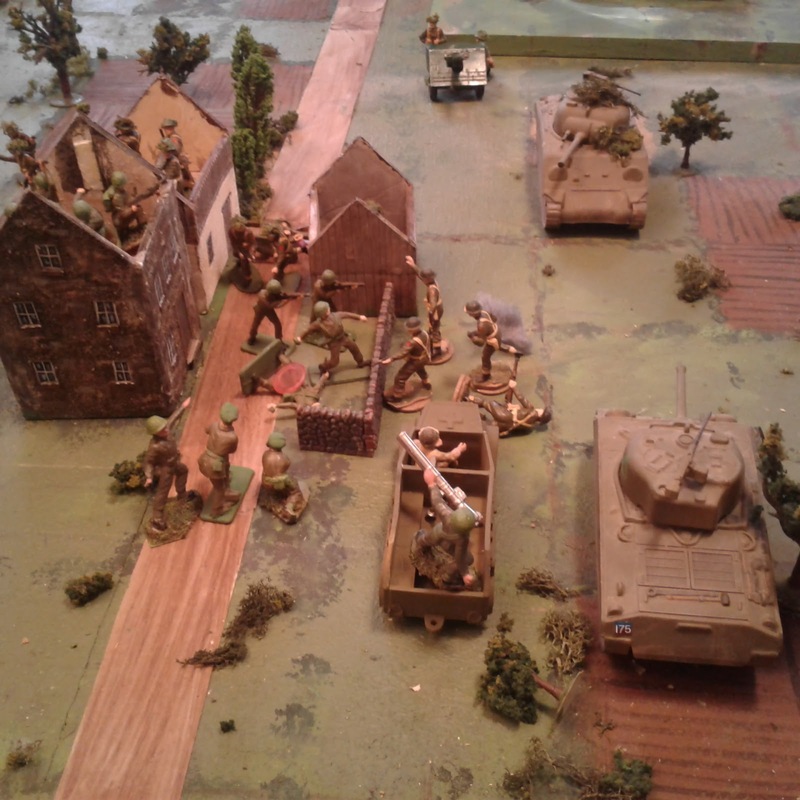 In both games I used the same dice for both sides and in both games the smaller American force outshot the British one! Hrmmph! Anyway as the two forces battled it out the larger size of the British battalion kept it in the fight but then about turn 13, the 104th appeared to reel under a particularly heavy US volley so Col. St. George pushed forward into the ranks, took a deep breathe and was shot from the saddle. The 104th didn't retreat but they refused to move forward and occupy the empty blockhouse. Leaving General Wavey the chance to re-occupy with the brave but battered regulars on the last turn of the game thus saving the day for American honour. Same scenario, roughly the same small forces but this time instead of a slow, 2 hour game that was over on turn 10 of 15, I had a quick paced game lasting about 45 minutes with several turns of fortune and a squeeker of a last minute win. It was the sort of game where one forgets to stop and take pictures. The poor Brits though! Out of 15 Initiative cards there were 6 face cards drawn. Two red jacks allowing the US to freeze the 104th twice on their approach march, 2 jokers meaning there ended up only being 13 turns instead of 15, a black King allowing an American unit to both move and fire and a black Ace with a chance of Gen Wavey being hit by stray bullet which he survived. Bloody cards are almost as biased as the dice! When I get the scribbled notes written up I will post them but there are figures to work on too! It was cold, damp and breezy yesterday. 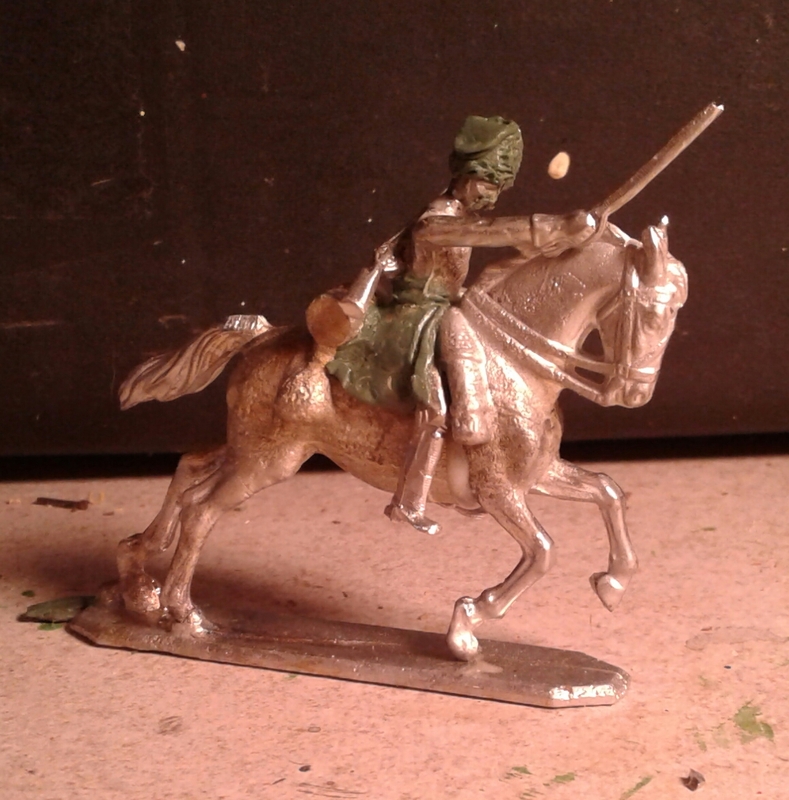 Not good weather for house painting or many other things but just fine weather for playing with toy soldiers. I confess to having been reluctant to turn to MacDuff and bothered that this should be the case but I persevered since this is exactly the sort of game that it was designed for. Since I didn't feel like running back and forth around the table I skipped the 1 card per unit/formation activation approach in favour of drawing for initiative. That was probably a mistake as was splitting the light companies into smaller units. The game begins. The British mission is to seize and destroy the blockhouse and bridge. The Americans began with a company of militia in the blockhouse supported by a detachment of riflemen (1/2 company). The rest of the riflemen and 2 companies of Regulars, led by General Wavey, are just marching on from the far corner of the table. Closer to the camera, Colonel St.George is leading the 4 companies of the 104th foot, supported by a 6 pounder and 3 half-companies of Indians and militia, to take the blockhouse and destroy the bridge. A scale of 1 figure = 5 men would have been appropriate for this sort of action, giving forces of 160 men vs 230 men, but the ground scale is at roughly 1"=10 yards meaning those numbers should really be doubled to 320 vs 460 making the engagement a bit larger than one would expect. Numbers matter but sometimes the numbers on the dice matter more than the number of figures! Having decided not to try to batter down the blockhouse with a 6 pounder, the various skirmishers were detailed to see off the enemy riflemen on the flanks or at least keep them occupied while the 104th formed line and advanced straight at 'em. The completely biased dice helped prolong things as the deadly American shooting balanced their inferior numbers for a while. Once their General went down though and the British finally started levelling their volleys better, the American Regulars were forced to retire with heavy losses. The British were then able to capture the blockhouse with the bayonet with time to spare. So, a very small but two hour long game taking up barely 2/3 of the available turns. Despite some frustrations from the variable length moves and a few tense or frustrating moments of combat when the dice seemed to be playing favourites, on the whole, the game was OK but not more. It wasn't the sort of game to inspire me to paint or play more of the same. At last the American Regulars have had enough and Colonel St. George leads his tired men in a charge on the blockhouse. Just as well he did lead them in person or they'd not have made it. The game reminded of all the things that I don't like about Solo MacDuff. One rolls an awful lot of dice, and spends a lot of time running back and forth around the table while the game takes a (relatively) long time to play with too much rolling of dice and too little thinking. The large number of dice also means usually average results despite the occasional upset. Most of these things fade away with two or more players as you are only rolling 1/2 the dice and have to try to figure out what your opponent is thinking as well as worrying about which unit will activate next. It took a lot of reflection and some idle pushing of figures about and considering of options to sort things out. Basically, it isn't a matter of me needing to "fix" a set of rules that weren't designed to fill my current desire or of me "having" to try to reconstruct historical small actions as accurately as I can, scales and all. It's a matter of me allowing myself to play games of toy soldiers set in an historical rather than a fictional setting. The Square Brigadier has proven a good choice for that sort of game for larger battles where a formed battalion will fit in one square but for lower level skirmishes I have yet to settle on a satisfactory rule to handle multi-square (or hex) battalions though treating adjacent 'companies' as separate, supporting units is probably the most practical approach if not fully satisfactory. However, before the "Grid", and the "Square Brigadier" or the "Portable Wargame", there was Hearts of Tin which was not grid based. I've been looking for a chance to re-incorporate these rules into my arsenal and this could be it! Reset the table! Places everyone!